The event on Crisis and Structural Reforms was successfully held on 27 November at the Bank of Greece. The occasion for the event was the publication of the report entitled “Structural Reforms in Greece during the Crisis: 2010-2014. Overview, Valuation and Policy Proposals “. The report was prepared by the Crisis Observatory on behalf of ELIAMEP and it was assigned to it by the Bank of Greece. Yannis Stournaras, Governor of the Bank of Greece, made the welcome remarks, while Mr. Loukas Tsoukalis, professor and chairman of ELIAMEP, introduced and moderated the discussion. 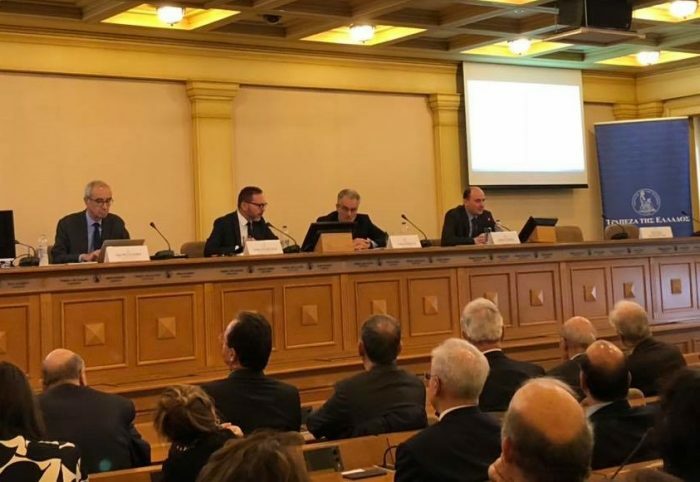 Dimitris Katsikas (Head of the Crisis Observatory and Lecturer at the University of Athens), as coordinator of the research, presented the main findings of the Report. Professor Jean Pisani-Ferry (Sciences Po, Paris / Hertie School, Berlin / EUI, Florence), commented on the findings of the report and spoke about the main challenges the eurozone and the global economy facing. The authors of the report are Dimitris Katsikas (coordinator), Marianthi Anastasatou, Elisavet Nitsi, Athanasios Petralias and Kyriakos Filinis. You can read the Report here (available only in Greek).